Meet debut author Elizabeth Moisan. 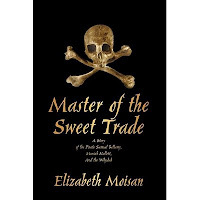 Her recent work of historical fiction is entitled Master of the Sweet Trade: A Story of the Pirate Samuel Bellamy, Mariah Hallet, and the Whydah. It follows swashbuckling pirate Sam Bellamy, as his simple quest to provide for his Cape Cod love Mariah Hallet turns into an insatiable lust for gold. The author explores the myths and realities of pirates with our audience. Why do they captivate us so? Come and sort out the romance and the ruthlessnes, the fascination and the fear, and leave with one good addition to you reading list.